Ever since the Solis Girl’s pattern released a lot of you have been asking for an adult version and while we had our doubts if this would work for adults, we now know you are right to have asked. This dress is amazing! Not only is this pattern amazing, but the results were awesome! We had such a great and sweet group of testers. So nice and supportive and wow, so many great results. They all look so amazing. The Women’s Solis Tunic and Dress looks like the kids version, only it’s made to hug our beautiful curves. Since not every one of us looks great in a natural waist slim fitted bodice (and some of us are pregnant) we added an empire waist bodice. With these two bodice lengths we can all wear this dress. No matter how tall, short, full figured or skinny you are. Our testers have proven this. I can hear you thinking, will it look good on me? Well, you can see for yourself. We’ll show you some pictures. Lets start with the natural waist, circle skirt version. We love the twirl this skirt gives you. The testers with a bit of a larger hip but slimmer waist told us this was their favorite option. Next up is the natural waist pleated skirt version. This is my favorite version, but since we are expecting a little tiny Sofilantje my waist is completely gone, for now…. When your hips are a little smaller and your waist is wider, this version might just be the one you need. At least give it a try. We’d love to hear what you think. Both versions above are the same as the Solis for girls. As you can see though, the women’s version has a slimmer fit and a more mature neckline. Also, the sides and back are high enough to wear a strapless bra or one of those other fun bras we’ve seen being used. There are so many bras out there that have the most amazing backs! Perfect for our beautiful Solis back. If you read this post, you read that I am missing my waistline at the moment. I’m not the only one… Plus, I know a few women who just look better in a high waist dress because of their body shape. So we added one more option. An option you will not find in the girl’s version. The empire waist option. Perfect for a lot of women who carry a little more weigh on their waist and those of us who are pregnant. It’s also perfect for those of us who can just wear anything. Here is how the empire waist looks on our beautiful not pregnant testers. And on us pregnant testers. Did you read all the way to the end? Yay! Lets get your reward. 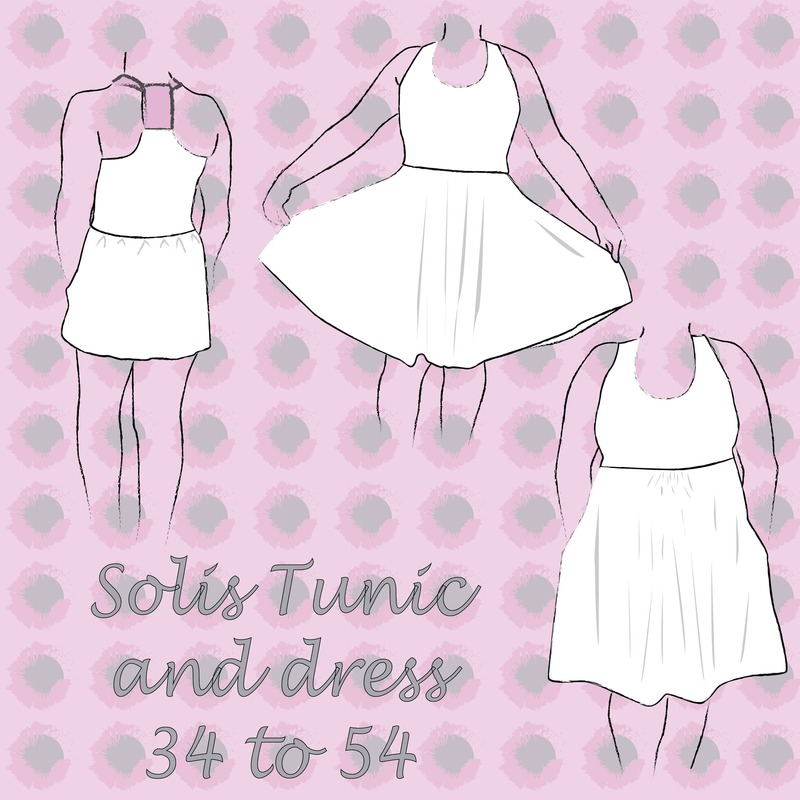 The Women’s Solis Tunic and Dress can be bought on SALE for only €5,60 (Excl. EU tax), but be quick, sale ends this Sunday (CET). Need more inspiration? Click the link below for the pattern in your language and check out the pictures.